As Seema Chandwani notes in asking for our support there is a danger of petition overdose, but numbers of signatures do make an impression. And as the young people note below it helps to make people feel that they are not alone. Hence we would encourage you to sign the following. – We found out the council has proposed to close our youth centre and cut our youth service from one of our parents. No one from the council has told us this was their plan. – When we read about this on the Haringey council website we were upset to read how the council has made our youth centre look bad. It is used by over 200 young people from the Tottenham area including people with disabilities who will have no where else to go. – It is not true that the youth centre and youth workers do not help us. They help us very much with personal problems, help getting a job, help with homework and they teach us things to be better people. – We invite anyone to come to the youth centre in bruce grove in the new year and see it for themselves. We also invite the chief executive and the council leader who have not visited it before. – We are upset that the description on the council website is tricking people to support cutting and closing us by making people think this is “investing in young people”. – We would like for someone to talk to us and ask us what we want. We understand that managers are telling politicians that they have asked us and we support these proposals. Those of us that attend bruce grove youth centre, our elected youth councillors and our elected uk youth parliament representative have not been asked anything. – Our youth workers really help us and our youth centre is always busy and gives us something to do and helps us with a lot of problems our parents and teachers do not. – We believe closing our youth centre and sacking our youth workers will make life for us worse and we do not understand why the council is doing this. – Since the riots everyone says they will help young people and this is not helping. – The youth service and youth centre is used by hundreds of young people who choose to use the service. this is a good thing so why damage it? We hope you can help save our youth centre and youth service. Please sign this petition. Thank you to all of the residents and organisations on twitter who have sent us kind words. We are glad we are not alone. 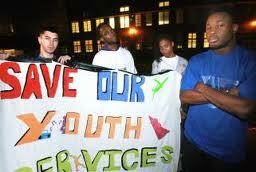 young people who use youth services in Haringey.